The present Cathedral was built in Baroque style by the Maltese Architect Lorenzo Gafà (1639-1703) on a site previously occupied by the medieval Cathedral. In 1679, the Cathedral Chapter requested the said architect to add an apsed structure to their old Cathedral to house the choir stalls which from the late fifteenth century were inserted in the presbytery of this church. Few years after the completion of this work, an earthquake which shocked the Maltese Islands in January 1693 caused serious damages to the old Cathedral. However, Gafà latest addition to it withstood bravely this disaster. 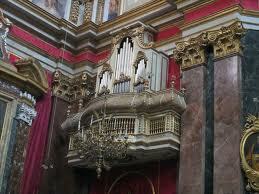 The same Chapter commissioned him to plan a new Cathedral that was to incorporate within it the said choir area. Work on this project started in 1696 and reached its completion in 1705 when work on its cupola came to an end. This marvelous Baroque structure enhances till the present-day this silent city of Mdina.Most probably, lack of space could have prevented him from providing an apsed-shaped structure at the end of its main aisle over the main door as well as to the two side-aisles of the transept. Such apses formed an important aspect of Maltese Baroque. It is most probable that he faced the same problem in drawing his plan for the Matrice church in Gozo’s Citadel. He interior of the new Cathedral incorporated in it other aspects that had already found their way earlier in local church architecture. Chief among these are the high-attic vaulting introduced in Malta by Franccesco Buonamici when he restructured the rib-vaulting of the Jesuit church in Valletta which, incidentally, introduced the Latin-cross plan pattern during the last decade of the sixteenth century. The Jesuit Architect Giuseppe Valeriano was the master-mind of this project. This plan was, afterwards. Adopted in the building of all Maltese parish churches and reached its peak, during the seventeenth century, particularly with the Mdina Cathedral. Some of the decorations that enhanced the medieval Cathedral have been also inserted in this Baroque structure. Chief among which are the present sacristy, built by Bishop Balthassar Cagliares sometime after 1623 as well as the main door that led to the old Cathedral dating back to 1530. This door was, eventually, inserted at the entrance of the said sacristy. Some of the works of art meant to decorate Gafà’s choir still enhance this area. Mattia Preti, apart from decorating its apse with a painting representing St Paul’s shipwreck, he was also commissioned to produce a series of seven paintings including the titular altar-piece figuring the Apostle’s Conversion, and another two portraying the martyrdoms of St Peter and St Paul while the remaining four presented other important episodes which connected St Paul to the Maltese Islands.. These paintings were donated to the Cathedral by Canon Antonino Testaferrata when Gafà completed his choir additional sector to the old Cathedral. Other relevant decorative and devotional entities from this old Cathedral are the following, namely, the Baptismal Font placed near the main door of the present Cathedral, donated by Bishop Jaymus Valguarnera sometime about 1495; an early fourteenth century icon of the Blessed Virgin presently inserted on the altar of the Blessed Sacrament chapel on the side of the north transept and a wooden crucifix sculptured by the Franciscan Fra Inocenzo from Petralia Soprana in 1640 and donated to the Cathedral by Bishop Fra Giovanni Balaguer da Camarasa set on the altar of the chapel of relics on the side of the south transept. The original polyptych that once stood on the main altar of the old Cathedral, which is dateable to the early decades of the fifteenth century and has been attributed to the circle of Luis Borassa (1360-1426), is still extant and forms part of the Cathedral Museum’s picture gallery. The present Cathedral was consecrated on the 8th October 1703, three years before work on the whole structure cam to an end. It is highly probable that this ceremony had been carried out at that time in order to enable Lorenzo Gafà witness this important event which crowned his life-long dedication in church building in the Maltese Diocese. He, in fact, died on the 13th February of the following year. The earliest decorative aspect that started embellishing in the new Baroque Cathedral was the insertion of marble in and around its altars as well as elsewhere. The earliest work executed in these media was carried out on the new main altar in 1721 through the generosity of Canon Giovanni Francesco Mangion. Soon afterwards, a bequest, inserted in the last-will of Bishop Fra Caspar Gori Mancini, provided the means for the decoration of St Publius chapel in the south aisle of the transept. A new marble altar surrounded by a reredos of the same material started being set in its place in 1729. Fra Giovanni Batista Balzan Dean of the Cathedral followed the example of the said Bishop and decorated in a similar way, the altar and its surrounding that stood in the north transept in front of St Publius’ chapel. This chapel was dedicated to the Annunciation of the Blessed Virgin. However, since the sum bequeathed for this project was insufficient to cover all costings, Archbishop Paul Alpheran de Bussan came to the rescue and provided whatever was needed. By 1758, this work had reached its completion. Concurrently with this intervention, the same Archbishop, during his lifetime, namely in 1755, had already financed the marble decoration of the altar and the reredos of the Blessed Sacrament chapel. Before the end of the eighteenth century, all side-chapels had been duly decorated with marble. However, the more important project in this respect, which culminated during the last decades of the same century, was the setting-up of a marble titular altar in the Cathedral’s choir together with the whole façade that surrounded the same altar. This work was entrusted to the care of a Neapolitan artist and architect, Vincenzo Bene and was carried out at Naples itself and set in its place during the last years of the 1780s. A highly exceptional work in inlaid marble covers all the floor of the Holy Crucifix or Relics chapel. It was designed by the Maltese Artist Francesco Zahra in 1765 and executed by Claudio Durante, who had carried out almost all the marble decoration in the side-chapels of the Cathedral. By then, a limited number of marble tombstones had also started being inserted both in the chapel of the Blessed Sacrament as well as in the transept. These, normally, covered the burial sites of local Bishops. From the nineteenth century onwards, similar tombstones started being inserted in the main aisle as well as in some side-chapels. The, mainly, covered the tombs of members of the Cathedral Chapter as well as members of families who had in their gift two side-chapels. These, indeed, provide a magnificent flooring due to the artistic aspect of inlaid marble and the representations that form the contents. It is worth noting that these tombstones provide a continuity to the similar pavement enhancing the Co-Cathedral of St John in Valletta. In the latter instance, though its tombstones, from the chronological point of view, start with the last decades of the sixteenth century, they came to an almost abrupt end with the last decade of the eighteenth century once the Order of St John was expelled from Malta. The Cathedral marble tombstones, which cover the main aisle and the side chapels, begin with the nineteenth century and offer a continuity till the present day. Moreover, while those at St John’s were, normally, executed abroad, the greater part of those at the Cathedral had been produced by local artists and craftsmen. The last major project in marble decoration at the Cathedral dates back to the first decade of the twentieth century. The Cathedral Chapter had been planning to provide further decoration to their church. Some of these projects from foreign artists, who were at that time involved in decorating some of the more prominent churches of the Maltese Islands, are still preserved in the Cathedral Museum. None of these, however, were actually implemented. It seems that the Cathedral Chapter opted for something different. Instead, it was decided to cover all the pilasters of the Cathedral with marble on par with similar decoration that had already centuries before, been adopted at St John’s Conventual church. Another decorative aspect of considerable importance are the paintings adorning this Baroque Cathedral. The only Maltese Artist of high reputation who was commissioned to carry out part of this decoration was Francesco Zahra during the second half of the eighteenth century. Apart from his master-piece which still covers the ceiling of the Chapter’s Hall and part of the paintings included in the Altar of Repose set up annually during Holy Week, he decorated the small domes of the Blessed Sacrament and Holy Relics chapels. Most probable Zahra cherished the hope to be entrusted with the painting of all the Cathedral’s ceiling and dome which were still bare in his days. This commitment was entrusted to other artists after Zahra’s demise, namely the Sicilian brothers Vincenzo, Antonio and Francesco Manno. These executed this work in fresco painting during the 1790s portraying various episode in St Paul’s life. For some unknown reason, they failed to paint the ceiling of the cupola which was entrusted to another foreigner, namely Giovanni Gallucci, in the 1860s. The same policy of employing Italian artists continued toi prevail throughout the second half of the nineteenth century and even afterwards. Various altar-pieces were substituted by works of such artists. These include Pietro Gagliardi, Domenico Bruschi and Francesco Grandi. The last in this series was Mario Caffaro Rorè who was commissioned to redecorate the dome’s ceiling since the mid-nineteenth century fresco painting had been deleted in 1927 due to structural problems of the cupola that needed immediate intervention. On certain feasts, various objects d’art adorn this Cathedral, which, though it was despoiled of almost all its silverware during the French occupation of the Maltese Islands (1798-1800), nevertheless managed to overcome these difficulties patricianly throughout the nineteenth century. Chief among these is a set of fifteen silver statues which originally belonged to St John’s Conventual Church, but were salvaged from their total destruction at the hands of the French during their short period in Malta, through the direct intervention of Bishop Gaetano Labini and the Cathedral Chapter. A heavy sum of money secured their acquisition otherwise they would have suffered their irreparable loss. They are the work of the Roman Baroque Artist Antonio Arrighi who produced them between 1741 and 1743. A highly important gilded silver processional cross, the work of late fourteenth century Venatian Artists was also saved on the same occasion. The main altar’s mensa, on similar occasions, is covered with a silver frontal designed by the Maltese Artist Joseph Hyzler and executed by Roberto and Saverio Cannataci.